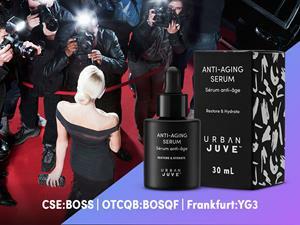 VANCOUVER, British Columbia, Feb. 26, 2019 (GLOBE NEWSWIRE) -- The Yield Growth Corp. (CSE:BOSS) (OTCQB:BOSQF) (Frankfurt:YG3) is pleased to announce that its wholly-owned subsidiary, Urban Juve Provisions Inc., had its products selected for inclusion in gift bags given to the Awards presenters during a pre-Oscars event at the Four Seasons Hotel Los Angeles at Beverly Hills on Saturday. /EIN News/ -- The bags included Urban Juve’s unisex lip balm and anti-aging serum, both of which are infused with hemp root oil extracted using the company’s patent-pending method. Urban Juve is set to unveil as many as 50 products this year for sale online and at retailers throughout North America. The Yield Growth Corp. is dedicated to the rapid and sustainable growth of cannabis wellness assets. Its directors, officers and advisors have C- level experience at multi-billion dollar international companies including M.A.C Cosmetics and Johnson & Johnson and have worked at Aritzia, Procter & Gamble, Skechers, Pepsi and Coca Cola. Yield Growth’s key assets are 100% owned subsidiaries Urban Juve Provisions Inc., UJ Topicals Inc., UJ Beverages Inc., UJ Edibles Inc. and Thrive Activations Inc. Urban Juve is a brand rooted in the organic synthesis of ancient knowledge and modern techniques to create exceptional beauty and wellness solutions. Ayurvedic knowledge delineates three general categories or skin types, which Urban Juve has translated as Vitalize, Balance and Align, each with its own dedicated range of skin and body care formulations. Through its subsidiaries Yield Growth owns over 60 wellness formulas for topicals and beverages, has registered 29 products with Health Canada, has applied for 11 U.S. provisional patents and is currently selling products online in the U.S. and Canada and through retailers in Canada. Its subsidiary UJ Topicals is launching THC and CBD products through a distribution network of 400 cannabis retail stores in Oregon, USA.